Her goal was to establish "back channel" lines of communication and push Moscow's agenda, authorities charged. The gun-loving former aide to a top Russian official has been arrested and charged with being a foreign agent who conspired with her ex-boss to infiltrate politically powerful U.S. organizations and push Moscow's agenda. 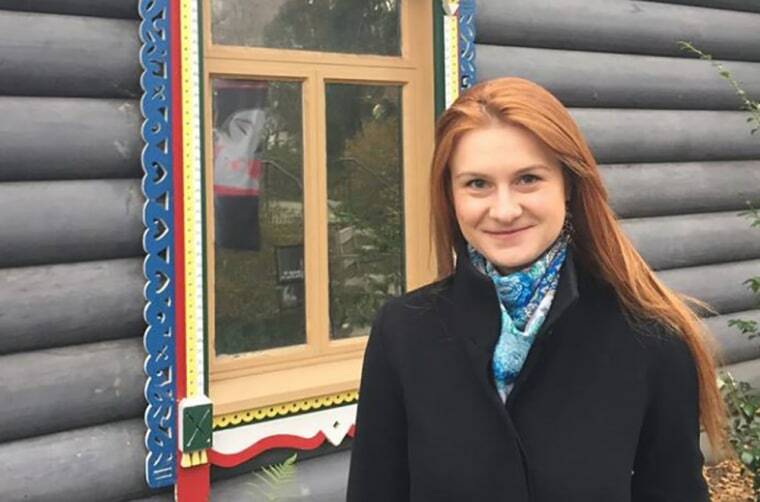 Mariia Butina, 29, who came to the U.S. in August 2016 on a student visa, previously served as a special assistant to a Kremlin crony whose description in court papers matches that of Alexander Torshin. Torshin is a former senator and deputy head of Russia's central bank who is close to Russian President Vladimir Putin. He was sanctioned by the U.S. Treasury Department in April 2018 and has been accused of links to organized crime, as NBC News has previously reported. "Butina and [Torshin] took steps to develop relationships with American politicians in order to establish private, or as she called them 'back channel' lines of communication,'" according to an FBI affidavit. "These lines could be used by the Russian Federation to penetrate U.S. national decision-making apparatus to advance the agenda of the Russian Federation." The FBI said in court papers Butina sought to establish relationships with a "gun rights organization." The organization was not named but a senior U.S. official confirmed it was the National Rifle Association, which did not immediately respond to a request for comment. In a November 2016 tweet, Torshin boasted that he and Butina were the only lifetime members of the NRA from Russia. Butina also attended the National Prayer Breakfast in 2016 and 2017 and told an unidentified American that the other Russians there were handpicked by her and Torshin and "are coming to establish a back channel of communication," the FBI wrote. A criminal complaint shows that the FBI obtained Twitter messages and emails between Torshin and Butina in which they plotted strategy and flattered each other with florid prose. "Your political star has risen in the sky," he wrote to her. "Now it is important to rise to the zenith and not burn out prematurely." Multiple senior law enforcement officials say Butina was under investigation for some time and was arrested Sunday because they believed she would soon move. In a tweet, the Russian Embassy in Washington said Monday evening that Russian officials had been in touch with American authorities about Butina and have sought access to her to "protect her legal rights." Butina's lawyer, Robert Driscoll, said in a statement that she is not an agent of the Russian Federation but an A student at American University who has been "cooperating with various government entities for months regarding public allegations related to her contacts with various American and Russian individuals." Mueller, who last week obtained indictments against a dozen Russian intelligence officials for election-related hacking, showed no interest in speaking with Butina, Driscoll said. She was instead charged by the U.S. Attorney's Office in Washington. The unsealing of the charges against Butina came within hours of a stunning press conference in Helsinki in which President Donald Trump refused to say he accepted the assessment of the U.S. intelligence community over Putin's denials that Russian had meddled in the election. Butina is a gun-rights advocate who cozied up to conservatives in the nation's capital. In February 2017, the Daily Beast reported that she was close to Republican activist Paul Erickson, who appeared at her birthday party months earlier dressed as Rasputin. Public records show she and Erickson registered a corporation in South Dakota together in 2016. In 2015, at an event in Las Vegas, Butina asked then-candidate Trump what he thought of sanctions against Russia. “I know Putin, and I’ll tell you what, we get along with Putin," Trump answered, adding, "I don’t think you’d need the sanctions." As NBC News reported in November 2017, Torshin wanted to invite candidate Trump to attend dinner during an NRA convention in Louisville, Kentucky, in May 2016 but the president's son-in-law, Jared Kushner, rejected the idea. Donald Trump Jr. did end up sitting with Torshin at the event, and Kushner never reported the Russian's overture, sources familiar with the matter told NBC News. Ken Dilanian and Pete Williams contributed.